We at luytenimport have specialised ourselves over the last 15 years in manufacturing custom pistons for a variety of models. Therefore we can fall back on the long-lasting experience of our employees in the technical department and in the production. This concentrated knowledge helps us to produce pistons of any design for old-timer, rare models and own constructions. In doing so we can manufacture high performance forged pistons from a diameter of 48mm up to 106mm. We offer solutions for any kind of pistons, 2 stroke or 4 stroke, car or motorcycle, one off or larger series, old timer or custom design. The piston comes complete with rings, pin and circlips. Especially for custom made pieces you need the knowledge of experts to be able to make exactly the right piston for your engine and particularly for your requirements. All we need is a sample of the piston that needs to be made, we will do the rest. If you require more compression, a bigger diameter or an exact copy, just let us know. we focus on maintaining and continuing to provide the highest quality pistons. We supply your needs and requirements! Every piston gets its unique code and will always remain your piston with it’s specific drawing. No other person can steal or use your ideas. 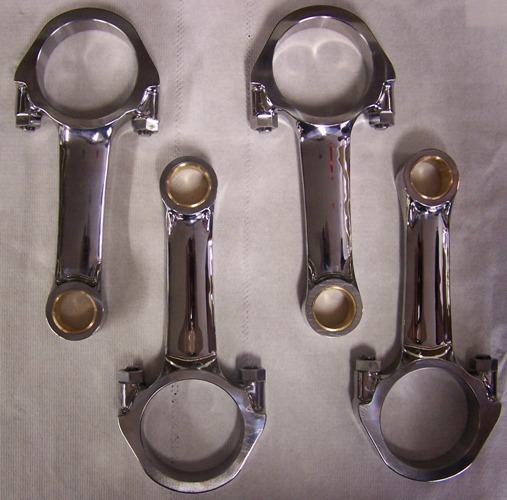 Besides pistons, we can also make custom made con rods. Again for any kind of engine, both 2 or 4 stroke. All what we need is a model or a drawing and we will make high end polished con rods.